Load up the helicopter on the transporter and get to work! Pull up in the heavy truck, detach the trailer and unload. Carry out maintenance on the helicopter and then connect the chain to the oil barrel to haul it to the site. Do your pre-flight check, start the rotors turning and take to the skies. There are always more supplies to deliver to the worksite! Price is 28% below the initial Lego retail price, a € 8.49 discount! This comes down to 6.94 cent per brick. ~ means with approximated delivery cost and VAT differences, as the actual delivery costs might vary due to item weight and/or dimensions. Prices and availability may have changed since the last update. 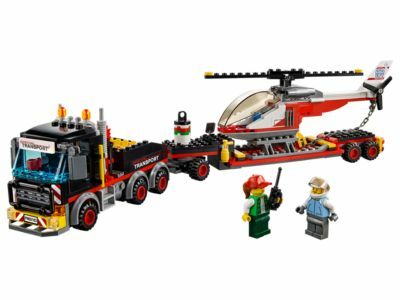 The Heavy Cargo Transport (60183) Lego set is available from the sites below. However, they do not offer delivery to your selected region. The Heavy Cargo Transport (60183) Lego set is no longer directly available from the sites below. However, 3rd party partners of these sites might still have the set available. Alternate description Haul in the helicopter to handle the heavy lifting! Includes 2 minifigures: a truck driver and a helicopter pilot. Features a heavy truck with bull bars, exhaust pipes, toolbox and opening cab, plus an extended trailer and helicopter with spinning rotors, opening cockpit and a chain. Connect the trailer to the truck to haul the helicopter to the next job. Drop the chain from the helicopter and hook it to the oil barrel to carry it to the worksite. Spin the rotors and launch the helicopter off the trailer. Accessory elements include a mug, box, wrench, shovel, walkie-talkie, fire extinguisher and an oil barrel. This popular kids toy is suitable for ages 5-12. Truck measures over 3” (8cm) high, 5” (14cm) long and 2” (6cm) wide. Trailer measures over 1” (3cm) high, 10” (27cm) long and 2” (5cm) wide. Helicopter measures over 3” (8cm) high, 8” (21cm) long and 1” (4cm) wide.